Keylock Scope Rings fit the PeepRib sight system as well as our 6-Screw Keylock Magnum scope base in 2-Ring and 3-Ring configurations. They also fit all other Weaver and Picatinny style bases with squared bottom cross slots. These are Matte Black 1" Rings with a .492" height. 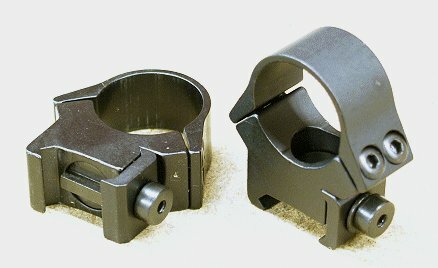 I have used these rings on two rifles. They were easy to mount and have maintained alignment even when removed and removed with the scope attached and remounted later. I needed to do this on my CVA Accura V2 for a MZ hunt in Colorado as optics are not allowed. upon return to NY I reattached the rings and scope assembly and was pleased to see that nothing needed adjustment, it still shot 1 inch groups @ 100 yds in the same location before I took it off. I have not tried this on the Matlin 336 30-30 yet but I expect the same results. I should add that I reload all my own ammo and do more then just slap on the mounts and rings. The most important set I take is to align the rings with a set of alignment bars and then lap the to get good concentric contact with the scope tube to eliminate any flexing of the tube.